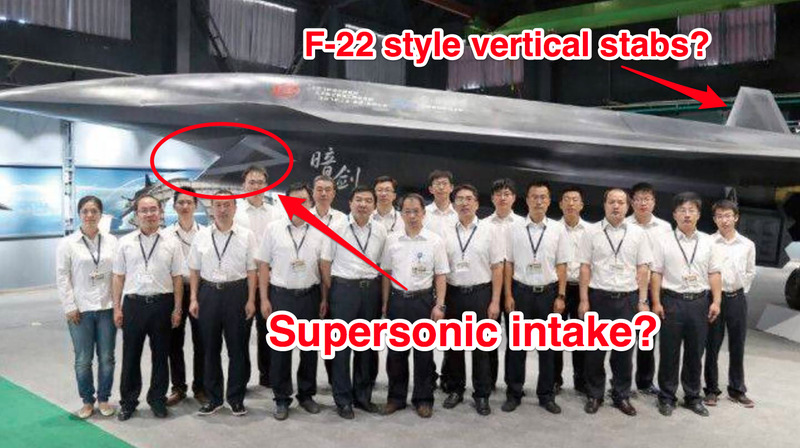 China released images of a new, unmanned, stealth fighter-style jet, and they present a shocking look into how close Beijing has come to unseating the US as the dominant military air power. An expert who examined the pictures said the drone, called the Dark Sword, could give China a big advantage in a fight with the US. The Dark Sword looks like an unmanned stealth fighter jet that could overwhelm the US with quantity and supersonic speed. The US thought about making a jet like this, but instead turned it into a tanker, and now it could be falling behind. China has already built stealth fighter jets that give US military planners pause, but the images of its new unmanned plane, named the "Dark Sword," suggest a whole new warfighting concept that could prove an absolute nightmare for the US. Justin Bronk, an air combat expert at the Royal United Services Institute, said the Dark Sword "represents a very different design philosophy" than US unmanned combat jet plans. Bronk examined the photos available of the Dark Sword and concluded it appeared optimized for fast, supersonic flight as opposed to maximized stealth. "The Chinese have gone with something that has a longer body, so it's stable in pitch. It's got these vertical, F-22 style vertical stabilizers" which suggest it's "geared towards supersonic performance and fighter-style capability." Though the US once led in designing drones, it was caught off guard by militarized off-the-shelf drones used in combat in the Middle East. Now, once again, the US appears caught off guard by China moving on the idea of an unmanned fighter jet — an idea the US had and abandoned. The US is now pushing to get a drone aboard aircraft carriers, but downgraded that mission from a possible fighter to a simple aerial tanker with no requirement for stealth or survivability in what Bronk called a "strong vote from the US Navy that it doesn't want to go down the combat" drone road. But a cliche saying in military circles rings true here: The enemy gets a vote. China, situated in the Pacific and surrounded to its east by US allies, has tons of airspace to defend. For that reason, a fast fighter makes sense for Beijing. "Something like this could transit to areas very fast, and, if produced in large numbers without having to train pilots, could at the very least soak up missiles from US fighters, and at the very best be an effective fighter by itself," said Bronk. "If you can produce lots of them, quantity has a quality all its own." In this scenario, US forces are fighting against supersonic, fearlessly unmanned fighter jets that can theoretically maneuver as well or better than manned jets due to not having pilots onboard. Perhaps somewhere in a windowless room, US engineers are drawing up plans for a secret combat drone to level the playing field. Bronk suggested that the US may feel so comfortable in its drone production that it could whip up a large number of unmanned fighters like this with relatively little time. Recent US military acquisition programs don't exactly inspire confidence in the Pentagon to turn on a dime. The US Air Force has long stood accused of being dominated by a "Fighter Mafia," or fighter jet pilots insisting on the importance of manned aircraft at the expense of technological advancement and perhaps air superiority. Another possibility raised by Bronk was that China's Dark Sword was more bark than bite. Because China tightly controls its media, "we only see leaked what the Chinese want us to see," Bronk noted. "It may be they're putting money into things that can look good around capabilities that might not ever materialize," he said. But, that would be "odd" because there's such a clear case for China to pursue this technology that could really stick it to the US military, Bronk said. So while the US may have some secret answer to the Dark Sword hidden away, or the Dark Sword itself may just be a shadow, the concept shows the Chinese have given serious thought on how to unseat the US as the most powerful air force in the world.